Counter sheets, rulebook and 4-color maps. 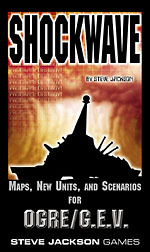 Shockwave is the first supplement for Ogre/G.E.V.. It includes 224 counters for a variety of new units, a full-color map that fits on any side of the G.E.V. map, and 12 scenarios (four for Ogre, eight for G.E.V.). New units in Shockwave include a devastating Cruise Missile (and a Laser Tower to shoot it down), two new types of GEV; and the Superheavy Tank!